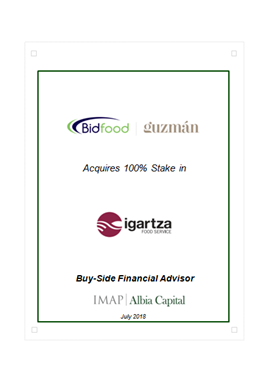 IMAP Albia Capital has provided advice to BIDFOOD GUZMÁN in relation to its 100% acquisition of the San Sebastián company IGARTZA FOOD SERVICE. With the acquisition of IGARTZA FOOD SERVICE, the South African multinational company Bidcorp (majority shareholder of Bidfood Guzmán) establishes itself with a strong leadership in the Basque distribution of fresh and frozen products for the hotel and catering industry market. BIDFOOD GUZMÁN is a comprehensive supplier for the HORECA sector in Spain and Portugal. It operates in the market since 1930 (Guzman Gastronomía) and has a continued market and product range growth trajectory. The company expects to close 2018 with sales of roughly 150 million Euros. Bidfood is one of the world’s leading companies in the hotel and catering distribution industry, It has an annual turnover exceeding 9,000 million Euros and operates in over 30 countries. IGARTZA FOOD SERVICE is a company with registered office in San Sebastián, engaged in the distribution of fresh and frozen products to the HORECA sector. It operates in a wide variety of categories which include both fresh meat and fish, and a comprehensive range of frozen and dry products. The company had a turnover of approximately €15 million in the last financial year and employs over 40 workers. IMAP Albia Capital (www.albiacapital.com) is a firm specializing in mergers and acquisitions, and it is an exclusive member of IMAP in Spain. IMAP is an organization with a presence in 35 countries averaging 220 transactions per year over the last 10 years.